Firefly. Photo credit: Farmers Almanac. There’s something magical about fireflies. They twinkle and dance like green stars on warm summer nights, turning our meadows and forest edges into fairyland. Here at the Arboretum, we are starting to see them glimmer and glow near the bayou and ravine. Unfortunately we don’t see many of them, and that problem isn’t unique to the Arboretum: everywhere, fireflies are disappearing. Fireflies have many nicknames, from lightning bugs to glow worms. But fireflies aren’t flies, bugs, or worms – they’re beetles! There are many species of fireflies found all over the world. Most are long, slender, black beetles, often with red markings. The firefly glow comes from the tip of the abdomen, where special chemicals are activated to produce a green or yellow light on command. Fireflies use those lights to attract one another, and each species flashes in a different pattern. Firefly larvae live in soil or under water, where they probably eat snails, worms, and other small creatures. Scientists know surprisingly little about fireflies. For example, we don’t know what most adult fireflies eat. The beetles are hard to study, as they are nocturnal and only live as adults for a short time. The larvae are also hard to find hiding under the soil or underwater. Most fireflies seem to prefer warm, humid areas of forest, meadow, or grassland with plenty of nearby water. They also seem to require rotting vegetation and long grass. The biggest mystery about fireflies is why they are disappearing. Everywhere around the world, firefly numbers are declining, and we don’t know why. Some scientists think fireflies are having trouble communicating because of light pollution. City lights, car headlights, porch lights, and others all confuse fireflies and make it hard for them to see one another. Habitat loss is also probably a factor. Fireflies need grassland, plenty of dead vegetation, and lots of water. Humans tend to cut long grasses, remove dead trees and rotting leaves, and drain small streams and ponds. 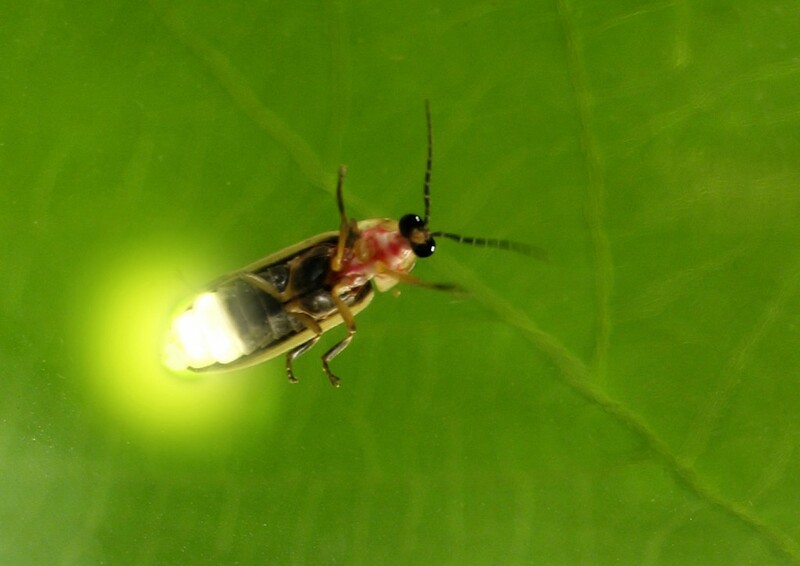 Pesticides may also be harming firefly larvae. Fireflies are a true natural wonder. If you want a chance to see them here at the Arboretum, come to A Bug’s Night Out on Saturday, May 7th from 8-10 pm. Chris Garza, one of our Conservation Team, will give a talk about nocturnal insects like fireflies. We’ll also go on a night hike to look for fireflies and other nocturnal critters, and we’ll talk about what you can do to protect insects like fireflies in your yard. This Saturday, May 7th at 8:00 pm, join us to learn more about fireflies and other insects at our Bug’s Night Out!